Order Woodforde Wherry 40 pints from the Stirling Homebrew Shop UK. 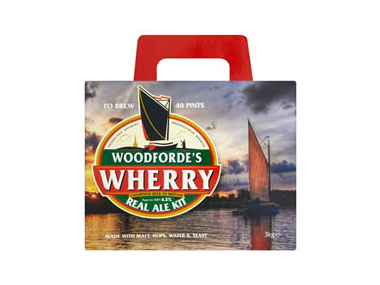 Buy Woodforde's Real Ale Kit - Wherry 40 pints and other Beer Kits & Cider Kits safely online in the UK. This ale kit creates a tasty ale with an inviting aroma of malt and citrus fruit. The palate is crisp and citrussy with malt and fine hop notes. This real ale kit creates a tasty ale with an inviting aroma of malt and citrus fruit. The palate is crisp and citrussy with malt and fine hop notes. Where to buy Woodforde Wherry 40 pints safely online? Shop at the Stirling Homebrew Shop if you are wondering where you can buy Woodforde's Real Ale Kit - Wherry 40 pints safely online in the United Kingdom. Woodforde Wherry 40 pints - Woodforde's Real Ale Kit - Wherry 40 pints in Beer Kits & Cider Kits and Homebrew.